As many of you know… I’m not a good player. As such this review should probably be read in the knowledge that, as far as list writing and rules goes, I have no idea what I’m talking about. Regardless, I’m ridiculously excited about the new Wood Elf book and I wanted to share some of my thoughts. First of all, the variation in the new book is astounding. Given the flexibility of most of the 8th edition books this was to be expected; GW have done extremely well in the past few years to write army books that allow you to take many different types of list to fit a range of play styles. The Wood Elf book is no exception, and is probably one of the best examples. At first glance, I can see potential for heaps of different styles of army, and I thought I’d talk about a few of my ideas here. A number of the below ideas revolve around one item, and it’s my favourite item in the book- Acorns of the Ages. These allow you to place D3 Citadel Woods in addition to your one free Wood on the table. 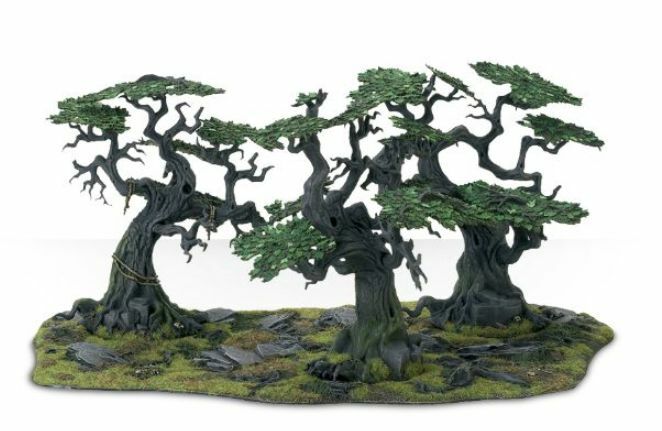 It’s 100pts, but I absolutely love the idea of the tricks and tactics you can use this for- not to mention how nicely it fits the Wood Elf fluff to always be fighting on a heavily forested battlefield! Forest Combat list. The addition of improved Eternal Guard, Wildwood Rangers and ranked up Dryads now gives Wood Elves the option of taking some blocks of combat troops. I particularly love the idea of a big block of Eternal Guard parked in a forest. If the enemy wants to fight them, they lose their steadfast but the Eternal Guard retain their Stubborn, fight in an extra rank and re-roll 1’s to hit. Backed up with Mindrazor, Wissan’s or one of the other buff/debuff spells, it doesn’t take much to break the enemy and run them down. I imagine they’ll need some hard hitting support in the form of Wild Riders or Treemen. Shooty List. While this has the potential to be extremely boring for your opponent, I really like it. Small units of 10 archers can deploy 3 wide and still fire with the full unit if they are in a wood (fire in an extra rank, plus volley fire with half the 4th rank rounding up). Waywatchers are now extremely flexible, being able to opt for multiple shots (2), or no armour save shots. A Waystalker can be given the Bow of Loren to give him two shots, which can be combined with Sniper and his no armour save ability to be potentially nasty. 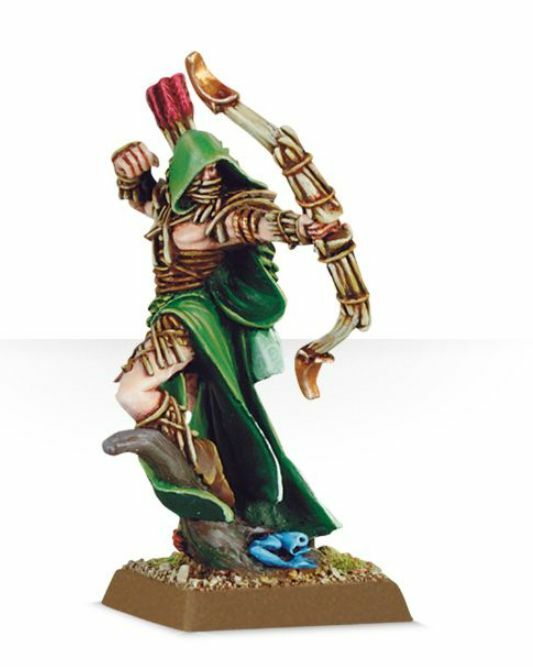 Deepwood Scouts provide you with some extra, cheap scouting units of archers. Fast Cavalry list. Taking Glade Riders as core there is potential to take a full army of mounted troops. Given that the characters now also gain the Fast Cavalry rule when mounted on an Elven Steed, they can easily be placed into the Wild Rider and Sisters of the Thorn units for some interesting combinations. I love the idea of a unit of Wild Riders with a character with the Moonstone. If you can squeeze in Acorns of the Ages to give you some extra forests then the Moonstone unit should have plenty of places to go. Combined with a couple of small units of Sisters of the Thorn throwing dice at Curse of Anrehir, the enemies movement will be restricted and this can be used to debuff enemies in combat with the Wild Riders to make them slightly less squishy. Life Magic would be great for this- being able to Regrow units like the Sisters and Wild Riders would be ace. My only disappointment with this list is the lack of chariots- I really hoped the new book would bring back Wood Elf chariots. 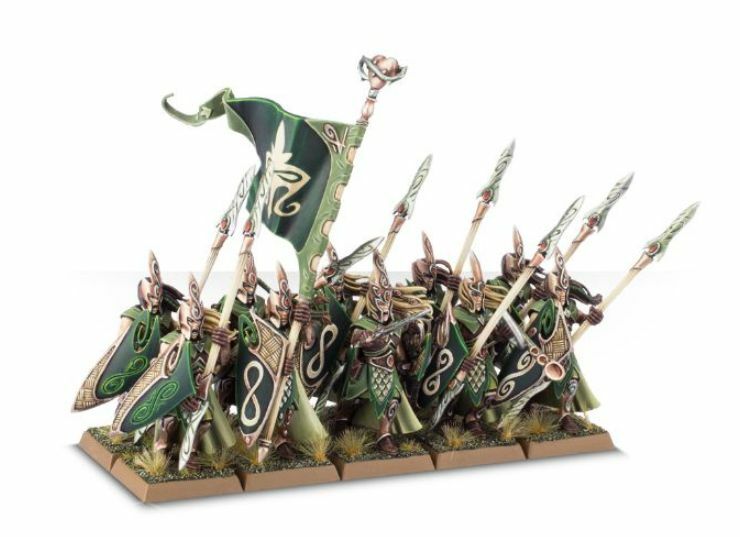 Still, perhaps in 9th edition I’ll be able to ally some High Elf chariots in to make a true Kindred of the Equinox army. Forest Spirit list. An obvious one, albeit probably not a power choice. 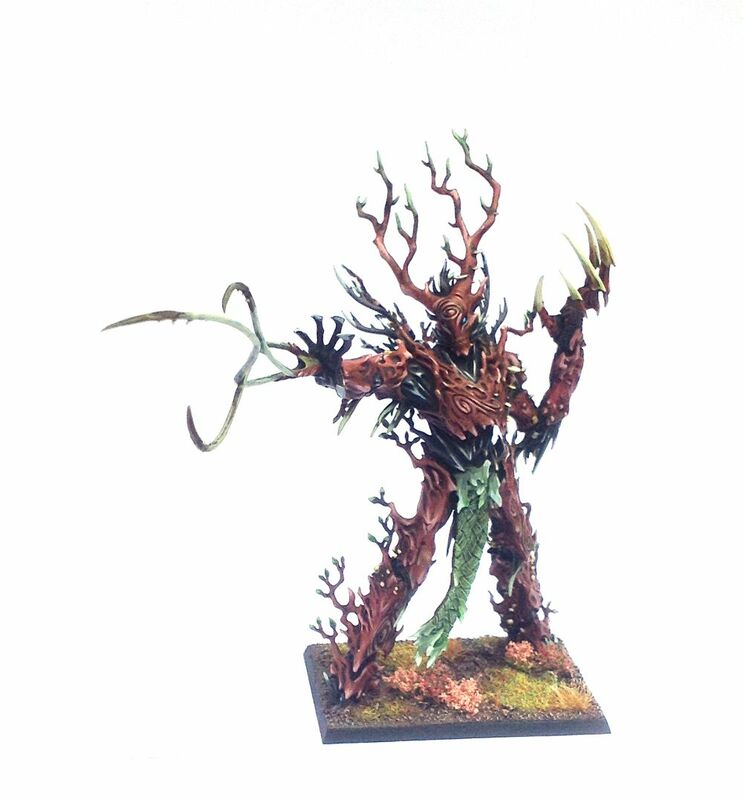 There is tons of modelling opportunity here, and it’s now a much more flexible list since the Treeman Ancient can be upgraded to a level 4 Wizard. 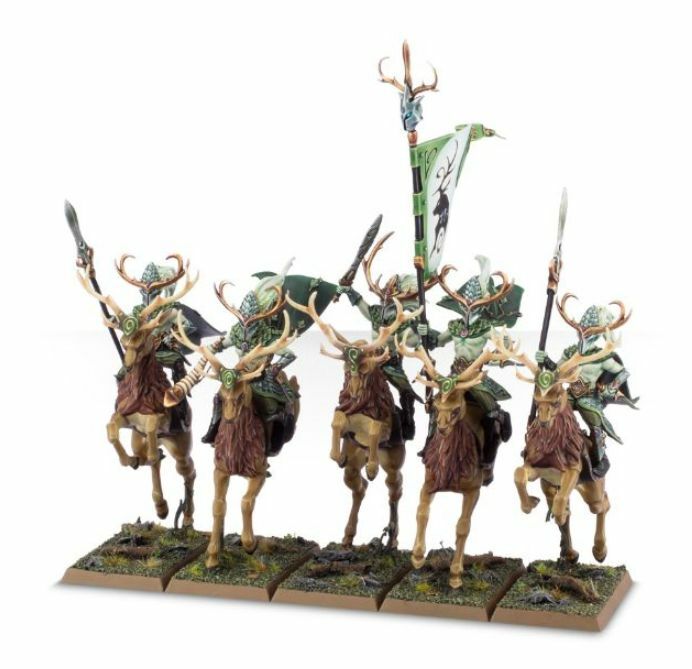 Slightly limited by only having the option of Treemen, Dryads, Treekin and Wild Riders, but I reckon you could convert some cool looking Sisters of the Thorn (mounted Branchwraiths?) to give you some further tactical flexibility. Drycha is very interesting as she allows some of your Forest Spirit units to ambush from Woods, though this will only work well on a heavily forested table (and it’s impossible to get the Acorns without shoehorning an Elf into your Forest Spirit army!). That’s all for now. I’m super excited, and the first thing I’ll be working on is finishing my old metal Glade Guard Spearmen so they can be my Eternal Guard, now that they are finally worth taking! 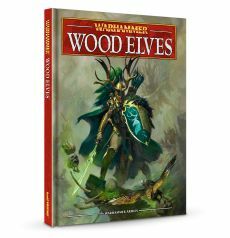 This entry was posted in Tournaments, Warhammer Fantasy, Wood Elves and tagged new wood elf army book, new wood elf rules, warhammer wood elf tactics, wood elf first impressions, wood elf rules, wood elf tactics, wood elf warhammer book, wood elves 8th edition. Bookmark the permalink.